Have you ever taken a second to think about how your physical environment supports your mind, body, and spirit? Our home is, in fact, one of the biggest foundations in our lives, and it supports our everyday wellness. By taking a holistic approach and creating a personalized space that is full of love, balance, and creativity, you're indulging in the ultimate form of self-care. As a crystal healer and interior designer with own company, The Crystalline, I've seen the benefits of doing so with my own eyes. What is an "energetically balanced" home? The first step in creating an energetically balanced home is asking the question, "Am I cheating myself out of living in the best environment possible?" I've lived in NYC for many years, and I'll admit, even as an interior designer I've had thoughts like, "Does this apartment really matter? It’s a rental, and I can’t even afford to decorate it the way that I want to." Thoughts like these can often lead to the realization that you don’t want to spend time in your house, and you certainly don’t want to entertain or have people over. And then you wonder why your life feels stagnant! Once you've established that your space doesn't live up to its potential, you can analyze how you want it to feel. Once you nail that, you're on your way to a well space—one that is energetically balanced from the inside out. One that is full of so much positivity that it overflows onto you. Where do crystals come in? I'm not a typical interior designer in that I usually start off consultations with a crystal healing or crystal therapy session. Every stone has a unique vibration, and when placed on the chakra points, they can be used to balance the body’s energy. I'll then guide clients through a visualization to re-harmonize and balance their energies, which gives me a clearer understanding of how to work with their space, calling on crystals for help. Crystals aren’t for everyone, and I totally understand that. There are subtle ways that you can incorporate them—in the corners of rooms, tucked under beds, or next to plants—so that your home doesn't feel like a rock shop. Many of us live in spaces that someone else has previously occupied, and in turn, they contain those people's energies. In order to clear the air in your space, consider cutting down on the following. Heirlooms: Family pieces may have sentimental value, but that doesn't mean that their energy resonates with yours. Parting with them doesn’t mean that you didn’t love their owner; it just means that object is no longer contributing to your life. Electronics: Consider cutting down on the sheer quantity of your electronics. These days, we’ve all got numerous devices going at all hours, and we wonder why we can’t sleep when our cellphone is right next to our head! Sage: Sage can be used to clear those relics of the past and move out that old energy. Open a window, light a sage stick, walk the perimeter of your home, tracing it up and down, and let the smoke get rid of any lingering and stagnant energy. Selenite: This is one of my top three must-have stones for space clearing. It removes energy blockages, so I like incorporating it into spaces to enhance the "out with the old" mentality. Salt baths: If possible, take salt baths during a period of clearing. Working on the inside as well as the outside really creates that shift in the mind, body, and space. You can even incorporate some of the selenite. This step varies depending on who you are as an individual and what you are trying to create in your space. It's about only inviting things in your home that are meaningful, functional, and beautiful. Let's break it down a bit. If you want to promote work. For example, if you're a writer who has writer's block often, look at how your office can better serve your purpose through inviting furniture and decorative, inspiring items. Additionally, I'd suggest stones like hematite, which filters distracting outside energy, and citrine, which helps boost creativity. If you want to promote romance. If you just went through a breakup or a divorce, you've hopefully gotten rid of the bed you and your ex shared, so now it's all about YOU! What type of bedroom or living space are you drawn to? Ask questions like, "How can I feel supported and nurtured through texture, color, furniture, and arrangement?" On the crystal front, consider layering in stones for self-love and abundance like rose quartz and aventurine. If you want to promote physical change. If you have low energy, think about what will make you less stressed. Maybe it's art or perhaps a meditation room or altar. Focus on how you can both preserve and replenish your energy in your home.  You might want to incorporate some energy-promoting stones like orange or yellow calcite, tiger's eye, and pyrite. Have a designated place to put your shoes, your keys, etc., when you walk in the door as you shed the day. Create a bath or shower ritual to wash the day’s energy off the body. Select products that have an olfactory effect, or take a crystal bath. Select your clothes for the next day in advance so that you feel confident and present your best self. Start a morning meditation practice, or begin one in the evening to unwind and allow the mind to rest before sleep. Constantly think about the senses. What does your home smell like? Consider adding more candles, or I love to incorporate different essential oils customized to my environment. Try having "no tech time" at least an hour before you go to sleep by putting your phone on airplane mode or ideally out of the bedroom. So the next time you look at your home, think about how you can make your interactions with your home as peaceful as possible. Ask yourself, what does a healthy home mean to you and how do you choose to nourish it? Turn any space into a happy home with these mood-boosting tips from a design psychologist. Have you ever taken a second to think about how your physical environment supports your mind, body, and spirit? Our home is, in fact, one of the biggest foundations in our lives, and it supports our everyday wellness. By taking a holistic approach and creating a personalized space that is full of love, balance, and creativity, you’re indulging in the ultimate form of self-care. As a crystal healer and interior designer with own company, The Crystalline, I’ve seen the benefits of doing so with my own eyes. What is an “energetically balanced” home? I’ve lived in NYC for many years, and I’ll admit, even as an interior designer I’ve had thoughts like, “Does this apartment really matter? It’s a rental, and I can’t even afford to decorate it the way that I want to.” Thoughts like these can often lead to the realization that you don’t want to spend time in your house, and you certainly don’t want to entertain or have people over. And then you wonder why your life feels stagnant! Once you’ve established that your space doesn’t live up to its potential, you can analyze how you want it to feel. Once you nail that, you’re on your way to a well space—one that is energetically balanced from the inside out. One that is full of so much positivity that it overflows onto you. I’m not a typical interior designer in that I usually start off consultations with a crystal healing or crystal therapy session. Every stone has a unique vibration, and when placed on the chakra points, they can be used to balance the body’s energy. I’ll then guide clients through a visualization to re-harmonize and balance their energies, which gives me a clearer understanding of how to work with their space, calling on crystals for help. Crystals aren’t for everyone, and I totally understand that. There are subtle ways that you can incorporate them—in the corners of rooms, tucked under beds, or next to plants—so that your home doesn’t feel like a rock shop. Many of us live in spaces that someone else has previously occupied, and in turn, they contain those people’s energies. In order to clear the air in your space, consider cutting down on the following. Heirlooms: Family pieces may have sentimental value, but that doesn’t mean that their energy resonates with yours. Parting with them doesn’t mean that you didn’t love their owner; it just means that object is no longer contributing to your life. Selenite: This is one of my top three must-have stones for space clearing. It removes energy blockages, so I like incorporating it into spaces to enhance the “out with the old” mentality. This step varies depending on who you are as an individual and what you are trying to create in your space. It’s about only inviting things in your home that are meaningful, functional, and beautiful. Let’s break it down a bit. For example, if you’re a writer who has writer’s block often, look at how your office can better serve your purpose through inviting furniture and decorative, inspiring items. Additionally, I’d suggest stones like hematite, which filters distracting outside energy, and citrine, which helps boost creativity. If you just went through a breakup or a divorce, you’ve hopefully gotten rid of the bed you and your ex shared, so now it’s all about YOU! What type of bedroom or living space are you drawn to? 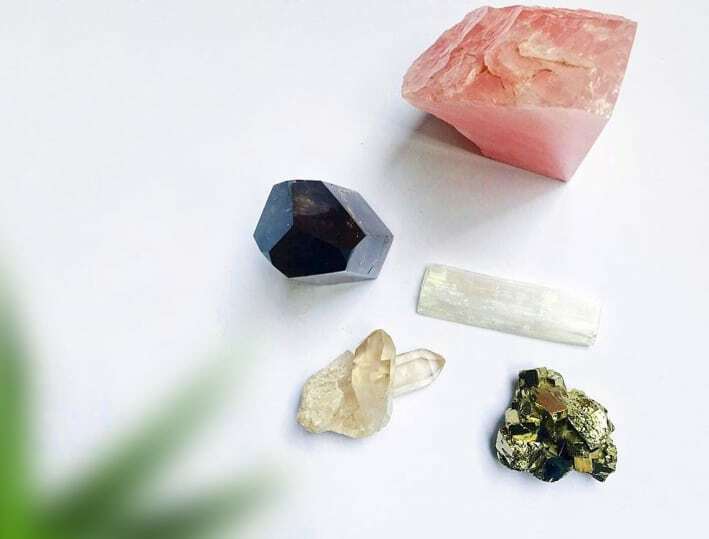 Ask questions like, “How can I feel supported and nurtured through texture, color, furniture, and arrangement?” On the crystal front, consider layering in stones for self-love and abundance like rose quartz and aventurine. If you have low energy, think about what will make you less stressed. Maybe it’s art or perhaps a meditation room or altar. Focus on how you can both preserve and replenish your energy in your home. 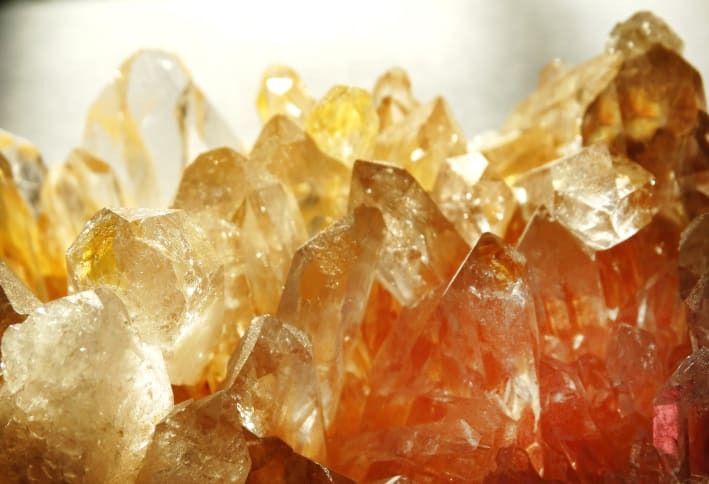 You might want to incorporate some energy-promoting stones like orange or yellow calcite, tiger’s eye, and pyrite. Try having “no tech time” at least an hour before you go to sleep by putting your phone on airplane mode or ideally out of the bedroom.